Do you wish to bring back the good look of your window surfaces quickly and efficiently?Are you seeking for methods of good window cleaning? If the answer is positive, you have come to the right spot! With the professionals of window cleaning in Raynes Park, you will certainly bring back the light into your house. You will enjoy impeccable glass surfaces as well as completely clean framework and sills. You will be able to use your freshly-acquired free time as you wish while we polish the windows of your home. You will not only avoid this monotonous and troublesome work – our services will additionally give you some alluring benefits. We also provide our professional services in nearby areas: Old Malden, Merton Park, New Malden, Worcester Park, Hillside. You will have perfectly looking office with the help of the experts of commercial window cleaning. You can count on our first-class services for every kind of business premises. For instance, if you have a small shop, we can carefully polish its windows by using water fed extension pole equipment – it helps us to go as high as the fourth floor. If you search for spotless look for the glass panes of a tall business property in London and the nearby areas, we will use our rope access equipment. In both cases, you will enjoy excellent results right away. The technicians have the abilities and the essential equipment to provide you with both private and commercial window cleaning. You can rely on us for every kind of glass surface cleaning. For instance, we can clean small or double windows, French doors, sash windows, bay windows and patio doors. Furthermore, if you have garden glass surfaces, greenhouse or roof windows, we can clean them as well. We use the most progressive methods and the next-generation equipment for all the previously mentioned window types. We are glad to use the best techniques to make sure that you get the best window cleaning. The glass surfaces of your building will look spotless after we employ water-fed extension pole cleaning system and high pressure cleaning on them. We use our vans to supply the poles with water and we can reach as high as the fourth floor. In case you need cleaning of highly-placed windows, we have rope access cleaners available. Call us on 020 3746 3113 and get in touch with us – these great methods will bring you results right away. 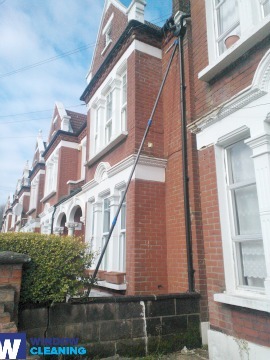 You will be proud of your absolutely clean home after the expert window cleaners in Raynes Park deal with this task. We provide the best services for the entire London area. The most modern ways of cleaning are included in our working routine – including water-fed extension pole system and and jet washing. You will see for sure the change domestic hygiene – we use purified water for the process of in and outside window washing. Call us today on 020 3746 3113. Our customer agents will help you and answer all of your questions. Furthermore, you can use our online booking from.